It is a privilege and with great pleasure to recommend Bart Christner, an exceptional instructor and photographer with mastery in digital media. Having held a professional career for 10 years as a pharmaceutical sales district manager, it was very inspiring to study under the instruction of a great teacher. Bart’s knowledge in digital media is second to none. His creative space, photographic eye, concept, theory as well as technical knowledge in Photoshop and Final Cut contributed to the overall success of the class including myself. More importantly, Bart’s level of professionalism and dedication to help students after class hours led not only to their success but also his as a digital media instructor. The caliber of work presented by the students was delivered on a very high level and recognized by the department. Bart displayed leadership qualities and led the class by example driving home not only the technical but also the creative aspect of film production. His desire to contextualize student work was displayed weekly through various assignments and thoughtful step-by-step processes that helped each individually and according to their respective needs. Projects were monitored thoroughly and extensively with extreme guidance and follow-through. Bart is very specific in his instruction, detail oriented and thorough, which makes him an excellent instructor. As a continuing education student, I was very inspired by Bart’s approach, open door policy, eagerness to help as well as his ability to drive the class to excellence. His rapport with the students including myself led to a very positive, open and creative environment where one is free to think, share and be!! He is very positive and encouraging and provides sufficient feedback tactfully guiding the creative process. I had the pleasure to assist Bart on a few shoots including a baby/family shoot, wedding, still life and location shoot. Bart was extremely gentle and kind in his approach and aware of his space. He was extremely encouraging in regards to creative contributions and ideas. Bart also successfully displayed his artwork weekly at a local Daytona Beach fairgrounds where he was successful in making new contacts, developing new business and networking within the community. 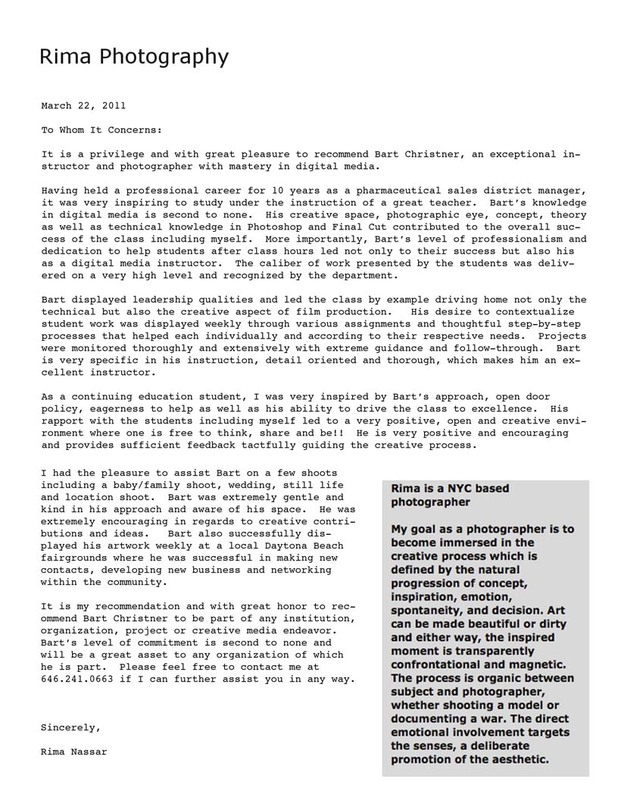 It is my recommendation and with great honor to recommend Bart Christner to be part of any institution, organization, project or creative media endeavor. Bart’s level of commitment is second to none and will be a great asset to any organization of which he is part. Please feel free to contact me if I can further assist you in any way.